The crash of the Schiaparelli Mars lander last month may have temporarily grabbed all the headlines – but now there is some good news. The Schiaparelli’s ‘mothership’ is proving to be a total success – as images sent back from of red planet prove. 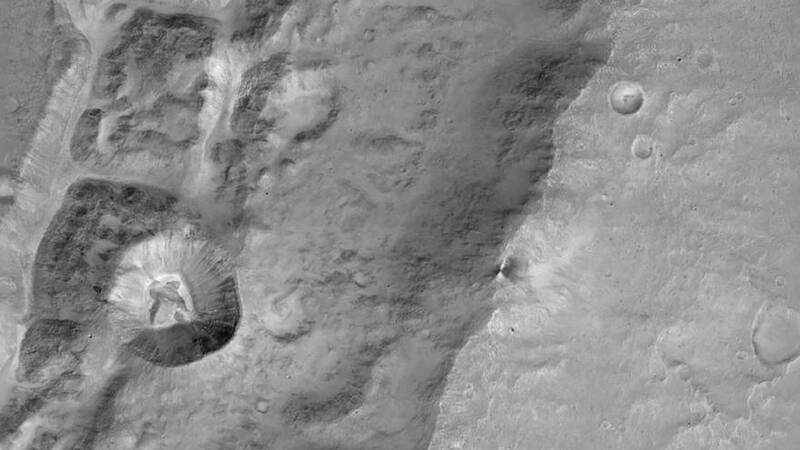 Space experts say the ExoMars Trace Gas Orbiter (TGO) has shown “great potential” for future observations. The ESA’s main probe has tested its toolbox of instruments in orbit for the first time. Data from this first orbit has been made available for this release to illustrate the range of observations to be expected once the craft arrives in its near-circular 400-kilometre altitude orbit late next year. The two instruments tested are the Atmosheric Chemistry Suite and the Nadir and Occultation for Mars Discovery intstrument. Eleven images were captured during the first close flyby on the 22nd of November. At its closest approach, the TGO was 235 kilometres above the surface of Mars, flying over the Hebes Chasma region, just north of the Valles Marineris canyon system. These are some of the closest images that will ever be taken of the planet by the TGO, given that the spacecraft’s final orbit will be at a higher altitude of around 400 kilometres. The TGO has spent the last two orbits (from the 20-28th of November) testing its four science instruments for the first time. It has also made important calibration measurements. The TGO’s main aim is to make a detailed inventory of the rare gases that make up less than 1% of the volume of the atmosphere on Mars. They include methane, water vapour, nitrogen dioxide and acetylene. Scientists are particularly interested in methane. On Earth, this is primarily produced by biological activity (think cows) and, to a lesser extent, by geological processes such as hydrothermal reactions. The TGO’s neutron detector, FREND, will measure the flow of neutrons from the planet’s surface. These are created by the impact of cosmic rays. The way in which they are emitted and their speed on arriving at the TGO points to the composition of the surface layer. This could indicate the existence of water or ice below the surface. The FREND has been active at various times during the cruise to Mars. On recent occasions, while flying close to the surface, it could identify the relative difference between regions of known higher and lower neutron flux. It also showed a clear increase in neutron detections when close to Mars, compared to when it was far away. However, it will take several months to produce statistically significant results.